According to Michael Leibowitz of 720 Global, the cumulative amount of new debt issued by the U.S government surpassed the cumulative amount of U.S. gross domestic product (GDP) growth in each year since the financial crisis of 2008. In other words, GDP economic growth would have been negative in every year following the crisis were it not for massive federal deficits. Unfortunately, it’s not just the past that we are talking about. 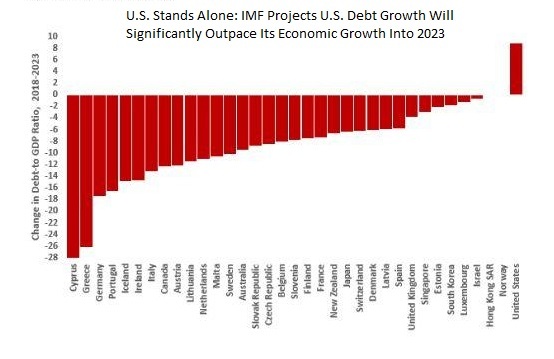 The International Monetary Fund projects that the U.S. is the only advanced economy slated to increase its debt-to-GDP ratio over the next five years. Why is this so disturbing? The higher that ratio climbs, the less willingness investors may have in buying our country’s debt without meaningfully higher interest rate adjustments. Ironically enough, I received a great deal of flack for suggesting that powerhouses like China and Japan might decide to further slow the pace of their Treasury bond purchases. Naysayers exclaimed that export-dependent countries would never shoot themselves in their proverbial feet and that the U.S. wields far more leverage than its counterparts at the trade negotiation table. 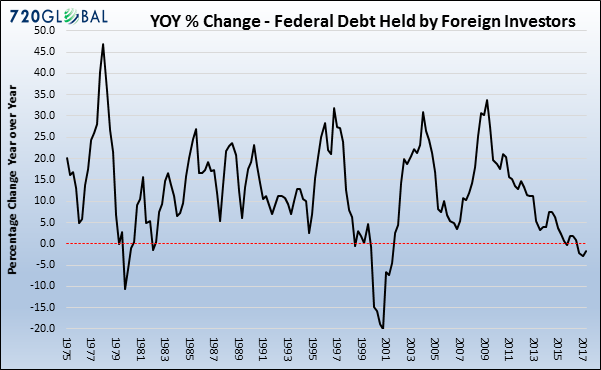 However, Federal debt held by foreign investors has been slowing on a consistent basis since its most recent peak back in 2009. In other words, foreigners have been reducing their Treasury acquisitions for quite some time and they might be willing to do so at a slightly faster pace. There’s more. Not only might foreign ownership continue to lessen, but the Federal Reserve is a net seller rather than a net buyer. They are reducing their balance sheet through a combination of selling securities and quantitative tightening (QT). So far, the Fed has downshifted from $2.465 trillion to $2.415 trillion. Drop in the bucket? Sure. On the other hand, the process of balance sheet reduction is expected to accelerate markedly throughout 2018.